Rain, sleet and snow began falling in Britain on Tuesday as a result of a cold blast barreling its way from eastern Europe. Heavy snow fell in Exmoor in south-west England and also across the Pennines in the north, while strong winds buffeted the coast. The latest forecast from the Met Office is for frequent showeres, locally wintry over hills, with North East England, Scotland, parts of Northern Ireland, as well as south and southwest england being hit heaviest. Today's temperatures will range between 6C-10C, although it will feel much colder than that due to strengthening winds. It could actually feel as cold as two degrees in some parts of the country when the wet weather and winds are factored in. The first significant snowfall of the winter comes amid warnings half of the country could be blanketed in snow before the end of November. A brutal winter blast forecast to hit in under a fortnight threatens to grind Scotland, northern and central England to a standstill. Blizzards driven by sub-zero polar gales will dump inches of snow across swathes of the country closing roads and throwing transport networks into chaos. 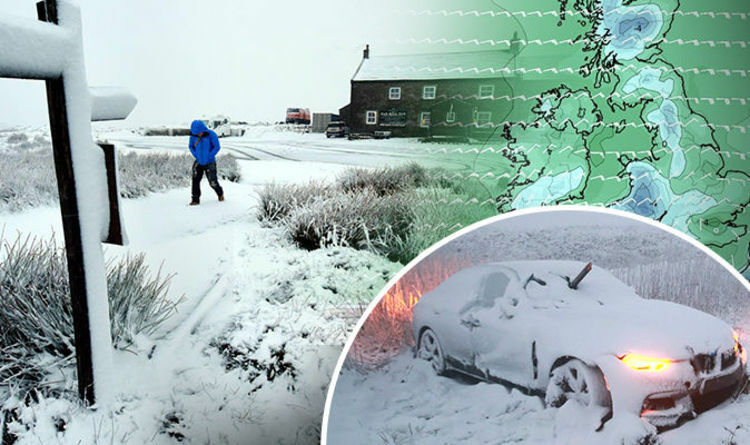 Experts have warned explosive low-pressure systems charging in from the Atlantic will clash with cold air over the UK triggering hailstorms and outbreaks of thundersnow. Temperatures will nosedive as icy winds make their way in from the North Pole and eastern Europe as fears the bitter weather could last until Christmas. By the end of this week, the mercury will sink below freezione with numbing winds making it feel close to -8C (17.6F) in some regions. But Exacta Weather forecaster James Madden warned: “We are about to enter a much colder period of weather which will bring wintry showers to parts of the country. “There are likely to be some more potent and widespread snow showers during the run up to Christmas some of which could be disruptive in nature.